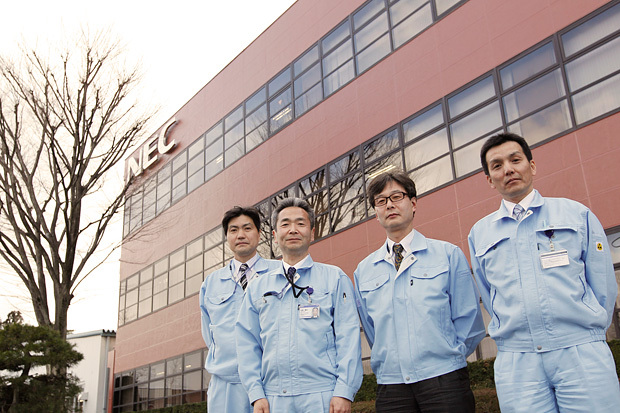 NEC Network Products was originally founded in 1973 as NEC Fukushima. A merger in 2000 turned it into NEC Wireless Networks. The current company name was given in 2011, when it was integrated with NEC Tohoku–which was the main factory and part of the NEC Group scattered across the Tohoku and northern Kanto regions–and NEC Anten , based in the city of Nasushiobara, Tochigi Prefecture, to represent the NEC Group’s united efforts in tackling difficult problems. The company’s main factory in Fukushima city is the “mother factory” for manufacturing the NEC Group’s communications products. NEC Network Products wants the factory’s production technology department members to support the expansion of the NEC Group’s production worldwide. 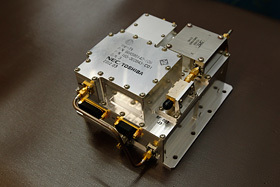 NEC Network Product’s foray into space equipment began, with regards to domestic products, with designing the power supply for communications equipment on board Kakehashi, the Communications and Broadcasting Engineering Test Satellite (COMETS) launched in 1998, and producing the power supply for communications equipment on board Hayabusa, the asteroid probe launched in 2003. Since then the company has been involved in projects including space communications equipment power supplies, solid-state power amplifiers and low-noise amplifiers by devoting efforts towards the manufacture of hybrid integrated circuits (HICs), which are essential components for these devices. The Great East Japan Earthquake that struck on March 11, 2011 affected the line in the clean rooms where NEC Network Products makes space communications equipment, while blackouts and interrupted water supplies cut off the air conditioning and otherwise inflicted damage. However, the company resumed production of general equipment on March 14. As for space communications equipment, NEC Network Products won the understanding of JAXA, satellite system makers in Japan and abroad regarding the effect the earthquake had on its manufacture of this equipment and the steps the company took to deal with it. The company then managed to resume manufacturing of these components 19 days later on March 30. Inside a clean room on March 11, immediately after the earthquake (left photo) and after it was restored on March 29 (right photo). Production was allowed to resume in the clean room on March 30 after final confirmation was made. NEC Network Products’ main factory in Fukushima city is the “mother factory” for the manufacture of the NEC Group’s communications products. This is the assembly line for HICs, a key component for space communications equipment that is manufactured in a Class 10,000 (Fed.209D) clean room. Skilled workers nimbly and accurately place chips to create the properties intended by designers. Manually operated machines are used for the wires and bonding that connects chips to circuit boards to maximize high frequency properties. Only workers who pass a skills test are allowed to do this. Here, assembled HICs are undergoing adjustments while having their electrical properties measured. No foreign substances are allowed on the components, even as small as 1μm. Workers carefully verify cleanliness with microscopes. Mitsuko Kanno, who works on HIC assembly, was recognized in 2011 as a Superior NEC Group Technician. The space communications equipment assembly line is designed with a flow shop approach to improve production efficiency. NEC Network Products uses a small vacuum chamber (left photo) and vibration tester (right photo) to reproduce conditions in space and during launch to verify that completed space communications equipment can tolerate those environments. Digital microwave communications equipment, mounted satellite equipment, TV transmitters, communications network control equipment, fixed/mobile communications equipment, satellite communications antennas, microwave communications antennas, etc. Communications equipment for the H-IIA/B Launch Vehicles etc. --The NEC Group works on developing many kinds of equipment, such as satellite systems, but what equipment does NEC Network Products work on? Our company is producing the ground-based parabolic antennas used to communicate with satellites, mainly space communications equipment. The NEC Group has been working on space equipment since we got involved in developing rocket telemetry transceivers for the Institute of Industrial Science at the University of Tokyo in 1956. Our company (then called NEC Fukushima) first worked on space projects in Japan by designing a communications equipment power supply for Kakehashi, the Communications and Broadcasting Engineering Test Satellite (COMETS), and producing a communications equipment power supply for Hayabusa, the asteroid probe. Kakehashi was launched in 1998 and Hayabusa in 2003. After that we produced communications equipment power supplies for the Kizuna high-speed internet satellite, the Kibo Japanese Experiment Module (JEM) on the International Space Station (ISS), the Akatsuki Venus probe and the Shizuku Global Change Observation Mission; the communications equipment power supply and low-noise amplifier for the Kaguya lunar orbiter; communications equipment and its power supply for the Michibiki Quasi-Zenith Satellite; communications equipment for the H-IIA/B Launch Vehicles and more. --What is your company's strength? Production techniques, in particular for hybrid integrated circuits (HICs) used in space communications equipment. We can't manufacture HICs on automated lines because space business field is basically a business of producing many parts in small volumes. Plus, the field demands advanced specs. The length of the bonding, wiring and such have a big effect on the properties of high-frequency circuits--typical analog circuits--so it makes more sense to base our production on the advanced skills of our workers. We particularly use a lot of analog techniques for radio reception and transmission components. If we buy the chips and just connect them with a machine, then we can't manufacture products with the properties we want. Thus, manufacture requires advanced skills. Many advanced skills are required of our workers, such as keeping all products as uniform as possible, choosing chip placement with the product's properties in mind and working faster than normal. For example, our designers give some leeway to circuit board and chip layouts when drawing up their plans, but properties degrade if chip intervals are too big, whereas if they are too close then the variation in thermal expansion will just break them. Our expert workers must have the skills to consider all of these factors as a whole, and place chips quickly and accurately in the chosen area to maximize their properties. This is why we assign particularly excellent workers, who have experience manufacturing HICs for general communications equipment used on the ground, to jobs producing HICs for use in space. --Has working on space equipment had ripple effects on other equipment in general? The way we think about quality assurance and traceability with our space production techniques is extremely helpful. We keep a complete production history including secondary material lot numbers, who worked on what and when, in addition to parts serial numbers and lot numbers. When something happens, our procedure is to go back and figure out the cause, fix the problem and move on. I believe that Japanese manufacturing's strengths are that our workers think for themselves and demonstrate their maximum capabilities. I also think that in our space business, our company's factories have a deep-rooted culture with a good blend of quality assurance and traceability systems. Of course, we are so incredibly happy that the satellite and rocket communications equipment we produce goes into space. And it's something we can boast about to our families since they show rocket launches in Japan on TV. Hayabusa especially got a lot of people's attention. If you look at the NEC Group overall, there are many students who want to join and work in space, so our work in that field is without doubt a useful recruiting tool. --What's the outlook for space? I believe that space is a vital business for us as a field requiring advanced manufacturing that maximally demonstrates our strengths as a Japanese company. I'm not exaggerating when I say that our incredibly skilled workers have been key to building our space business. For example, if we were asked to start work tomorrow on doubling our workforce engaged in space equipment production, it wouldn't be easy. It takes a very long time. That's why we intend to systematically build our human resources and equipment so that we can further grow our space business. However, we have to take profits into account. That's why we want to improve all our lines in terms of QCD (quality, cost and delivery). Since fiscal 2009, we've been expanding with a goal of "tripled productivity and a ten-fold improvement in quality" as stipulated by our three-year plan. In order to achieve major productivity improvements, we perform fundamental reviews from the design stage, and give thorough consideration to what parts to use and how we can structure things to facilitate production. We also produce space communications equipment with a flow shop approach, when in the past we had a job shop approach. Every day we're making improvements so that everyone can figure out what our progress is right away. We always have to do things like this to survive against the competition. In addition to the measures I've discussed thus far, I'd like us to contribute to the NEC Group's and Japan's progress in using and developing space as we work on our production techniques at our Ichinoseki and Nasushiobara factories. From left: No. 3 Manufacturing Department Manager Hiroyuki Tanji, Executive Takashi Matsuura, Development Department Expert Bunsuke Ogawa, and Common Manufacturing Department Group Manager Hideo Ichijo.